The Art Deco movement is an interesting design philosophy that seems to be growing in popularity. The style combines the best of both worlds traditional and modern and can, with the right styling, look great in both modern and older houses. So what is the Art Deco movement? Art Deco, sometimes referred to as Deco, is a style of visual arts, architecture and design that first appeared in France just before World War I. It influenced the design of buildings, furniture, jewellery, fashion, cars, movie theatres, trains, ocean liners, and everyday objects such as radios. It took its name, short for Arts Décoratifs, from the Exposition Internationale des Arts Décoratifs et Industriels Modernes (International Exhibition of Modern Decorative and Industrial Arts) held in Paris in 1925. It combined modernist styles with fine craftsmanship and rich materials. During its heyday, Art Deco represented luxury, glamour, exuberance, and faith in social and technological progress. Art Deco was a pastiche of many different styles, sometimes contradictory, united by a desire to be modern. From its outset, Art Deco was influenced by the bold geometric forms of Cubism; the bright colors of Fauvism and of the Ballets Russes. 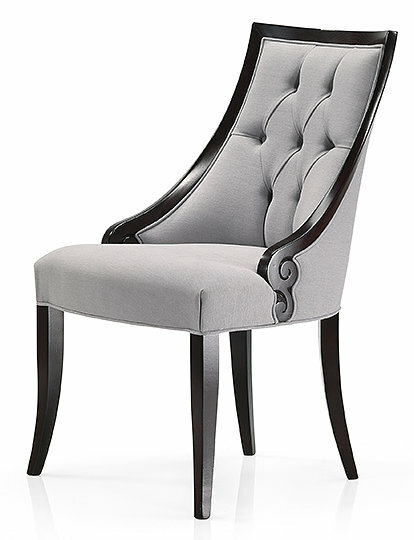 There are no particular rules of proportion or colour, but we categorise our dining chairs as art deco as a modern design with some influences of the past. This has traditionally influenced lines but some have been elongated, some lines smoothed out but there is a definite foot in both the modern and traditional world. You can customise this chair by choosing from 13 fabrics and 12 wood stain colours. This is another example of a traditional but modern design which we categorise as Art Deco. The lines are classic but are influenced by tradition without following it slavishly. 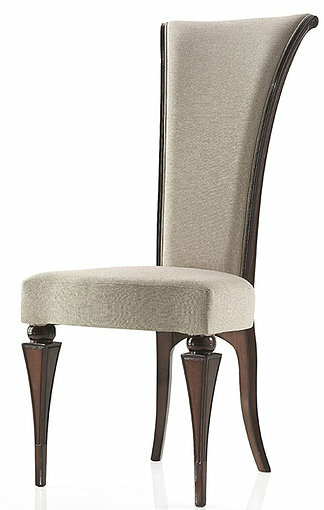 This creates a chair that is equally suited to modern or traditional dining room decors. See this link for more information and options fabric and colours.